So, last week’s combination of a bunch of great images of volcanoes from space with the Smithsonian/USGS Global Volcanism Program’s Weekly Volcanic ActivityReport went over so well, I thought I’d try it again. I’m having trouble coming up with a catchy name for this feature, so if you have any ideas, leave them in the comments below. As ever, special thanks to Sally Kuhn Sennert for putting together the weekly report over at the GVP and the NASA Earth Observatory for the amazing images taken from orbit. 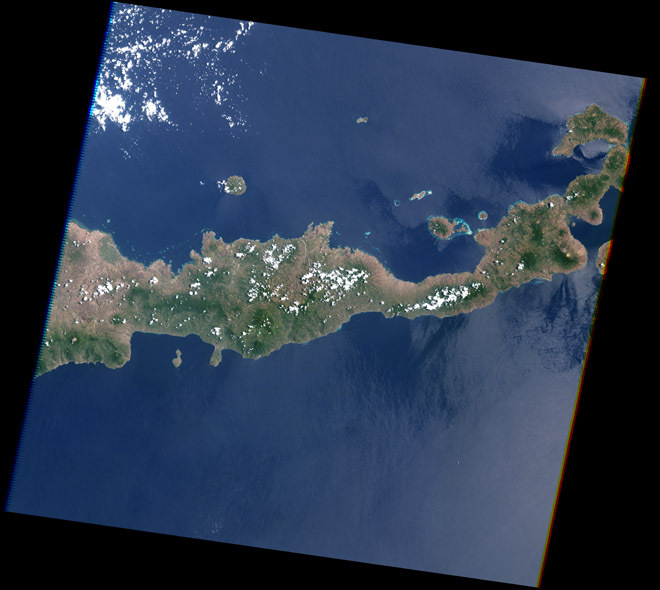 Last week I mentioned that I couldn’t find any images of Lewotobi in Indonesia in the NASA EO archive. Well, leave it to them to go and find me some images of the volcano in question, along with a couple other great gems. This is the Isle of Flores in Indonesia, one of main islands of the nation. It isn’t known for its volcanoes but it does have a few, including Lewotobi and Kelimutu (see both above). Flores is, at least right now, most known for the rare species of human that apparently lived on the island from ~17,000 to 9,500 years ago — Homo floresiensis, the famous “Hobbit” fossils. Now, there is still debate over the true place that Homo floresiensis has on the family tree of humans, but so far, they have only been found on Flores.